The New York Yankees acquired outfielder Giancarlo Stanton from the Miami Marlins in December, but he truly became a Yankee on Wednesday night when he hit a walk-off home run to cap a come-from-behind win over the Seattle Mariners at Yankee Stadium. Following the 7-5 win, Stanton reflected on the moment, per ESPN.com's Coley Harvey: "That's what you always want. You help win a game and you have your whole team waiting for you, that's what you always hope for. Fun moments and good future memories." Stanton was named National League MVP last season when he hit .281 with a league-leading 59 home runs and 132 RBI. His tenure with the Yankees has been up and down thus far, but he has been finding his stroke of late and now boasts a line of .255/.329/.504 with 18 homers and 42 RBI. Stanton has hit home runs in back-to-back games and is on a five-game hitting streak. 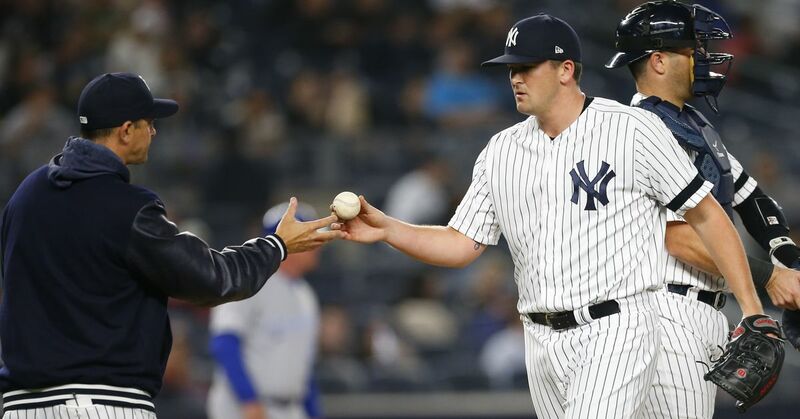 Wednesday's walk-off homer may prove to be the catalyst in a break out, but Yankees manager Aaron Boone isn't ready to say that it was definitively the moment that made him a Yankee: "Maybe when we look back on the year, this will be something they can point to. Certainly for Giancarlo, a guy of his stature. But I don't get that much into that. I'll let you guys define that." Stanton's home run gave New York its third straight win, and the Yankees have now won six of their past seven games. The Yanks are 49-22 overall, which is the best record in baseball and good for a two-game lead over the Boston Red Sox in the American League East. Despite the fact that the likes of Stanton and catcher Gary Sanchez haven't played to their fullest potential this season, the Yankees are establishing themselves as the class of MLB, and they are trending toward setting all-time records in power hitting. While the 1997 Seattle Mariners own the single-season record for team home runs with 264, the Yankees already have 120 through just 71 games. The Yankees are already a handful for the opposition, but if Stanton is on the verge of a hot streak, then New York may be ready to start separating itself from the field even more in the coming weeks.